This article is about the Seleucid King of the third century BC. For the king of Commagene of the first century BC, see Antiochus I Theos of Commagene. Antiochus I Soter (Greek: Ἀντίοχος Α΄ ὁ Σωτήρ; epithet means "the Saviour"; c. 324/3 – 2 June 261 BC), was a king of the Hellenic Seleucid Empire. He succeeded his father Seleucus I Nicator in 281 BC and reigned until his death on 2 June 261 BC. Silver coin of Antiochus I. 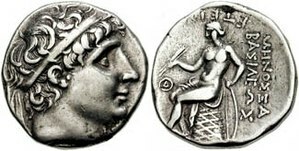 The reverse shows Apollo seated on an omphalos. Antiochus I was half Sogdian, his mother Apama, daughter of Spitamenes, being one of the eastern princesses whom Alexander the Great had given as wives to his generals in 324 BC. The Seleucids fictitiously claimed that Apama was the alleged daughter of Darius III, in order to legitimise themselves as the inheritors of both the Achaemenids and Alexander, and therefore the rightful lords of western and central Asia. In 294 BC, prior to the death of his father Seleucus I, Antiochus married his stepmother, Stratonice, daughter of Demetrius Poliorcetes. His elderly father reportedly instigated the marriage after discovering that his son was in danger of dying of lovesickness. Stratonice bore five children to Antiochus: Seleucus (he was executed for rebellion), Laodice, Apama II, Stratonice of Macedon and Antiochus II Theos, who succeeded his father as king. Cylinder of Antiochus, as great king of kings of Babylon, restorer of gods E-sagila and E-zida. Written in Akkadian, Babylonian and Assyrian. On the assassination of his father in 281 BC, the task of holding together the empire was a formidable one. A revolt in Syria broke out almost immediately. Antiochus was soon compelled to make peace with his father's murderer, Ptolemy Keraunos, apparently abandoning Macedonia and Thrace. In Anatolia he was unable to reduce Bithynia or the Persian dynasties that ruled in Cappadocia. In 278 BC the Gauls broke into Anatolia, and a victory that Antiochus won over these Gauls by using Indian war elephants (275 BC) is said to have been the origin of his title of Soter (Greek for "saviour"). At the end of 275 BC the question of Coele-Syria, which had been open between the houses of Seleucus and Ptolemy since the partition of 301 BC, led to hostilities (the First Syrian War). It had been continuously in Ptolemaic occupation, but the house of Seleucus maintained its claim. War did not materially change the outlines of the two kingdoms, though frontier cities like Damascus and the coast districts of Asia Minor might change hands. In 268 BC Antiochus I laid the foundation for the Ezida Temple in Borsippa. His eldest son Seleucus had ruled in the east as viceroy from c. 275 BC until 268/267 BC; Antiochus put his son to death in the latter year on the charge of rebellion. Around 262 BC Antiochus tried to break the growing power of Pergamum by force of arms, but suffered defeat near Sardis and died soon afterwards. He was succeeded in 261 BC by his second son Antiochus II Theos. Antiochos I coin. Antioch mint. Macedonian shield with Seleucid anchor in central boss. Elephant walking right, with Greek legend ΒΑΣΙΛΕΩΣ ΑΝΤΙΟΧΟΥ - "of King Antiochus". "And even this conquest [preaching Buddhism] has been won by the Beloved of the Gods here and in all the borderlands, as far as six hundred yojanas (5,400–9,600 km) away, where Antiochus, king of the Yavanas [Greeks] rules, and beyond this Antiochus four kings named Ptolemy, Antigonos, Magas and Alexander rule." "Everywhere within Beloved-of-the-Gods, King Piyadasi's [Ashoka's] domain, and among the people beyond the borders, the Cholas, the Pandyas, the Satiyaputras, the Keralaputras, as far as Tamraparni and where the Greek king Antiochus rules, and among the kings who are neighbors of Antiochos, everywhere has Beloved-of-the-Gods, King Piyadasi, made provision for two types of medical treatment: medical treatment for humans and medical treatment for animals. Wherever medical herbs suitable for humans or animals are not available, I have had them imported and grown. Wherever medical roots or fruits are not available I have had them imported and grown. Along roads I have had wells dug and trees planted for the benefit of humans and animals." Alternatively, the Greek king mentioned in the Edict of Ashoka could also be Antiochus's son and successor, Antiochus II Theos, although the proximity of Antiochus I with the East may makes him a better candidate. The love between Antiochus and his stepmother Stratonice was often depicted in Neoclassical art, as in a painting by Jacques-Louis David. ^ "Antiochus I Soter". Livius. ^ Holt, Frank L. (1989), Alexander the Great and Bactria: the Formation of a Greek Frontier in Central Asia, Leiden, New York, Copenhagen, Cologne: E. J. Brill, pp 64–65 (see footnote #63 for a discussion on Spitamenes and Apama), ISBN 90-04-08612-9. One or more of the preceding sentences incorporates text from a publication now in the public domain: Chisholm, Hugh, ed. (1911). "Seleucid Dynasty s.v. Antiochus I. Soter" . Encyclopædia Britannica. 24 (11th ed.). Cambridge University Press. p. 604. ^ Shahbazi, A. Sh. "Apama". Encyclopaedia Iranica. ^ Oelsner, Joachim (2000). "Hellenization of the Babylonian Culture?" (PDF). The Melammu Project. Retrieved 6 June 2017. ^ Smith, Andrew. "Johannes Malalas - translation". www.attalus.org. Retrieved 2017-06-06. ^ a b Jarl Charpentier, "Antiochus, King of the Yavanas" Bulletin of the School of Oriental Studies, University of London 6.2 (1931: 303–321) argues that the Antiochus mentioned was unlikely to be Antiochus II, during whose time relations with India were broken by the Parthian intrusion and the independence of Diodotus in Bactria, and suggests instead the half-Iranian Antiochus I, with stronger connections in the East. ^ Translation of Jarl Charpentier 1931:303–321. Traver, Andrew G. (2002). From Polis to Empire, the Ancient World, c. 800 B.C.-A.D. 500: A Biographical Dictionary. Greenwood Publishing Group. ISBN 9780313309427. Retrieved 7 September 2013. Hellenization of the Babylonian Culture?